My father used to tell the story of an elderly couple living in a small New England town. Strategic account management in the most forward-thinking companies is undergoing a transformation that is increasing sales effectiveness and company profitability by 33% or more. The most effective strategic account managers are shifting their focus from maximizing sales and gross margins, to going directly after major net profit increases in key accounts – without the false assumption that more sales equals more profits. In fact, nowhere is this false assumption a bigger mistake than in major account management. Strategic accounts certainly have the scale and scope to provide critical revenues and gross margins. They are very important to revenue growth. However, major accounts also have massive power to reduce prices and to extract costly service packages. For most companies, and certainly for most strategic account managers, this pressure is very hard to resist. This major account power leads to the extremely difficult situation in many companies, in which major account revenues increase while net profits actually decline. All too many strategic account managers find themselves in essence polishing the cannon. What can a strategic account manager do? The most important factor in strategic account management is the vast difference between selling revenues and selling net profits. Most selling systems simply assume that these are equivalent, but nothing could be further from the truth. In years of work on maximizing profitability, and in the billions of dollars of annual client revenues that run through Profit Isle’s, my company’s, analytical systems (see www.profitisle.com ), I have found that a surprisingly small portion of a company’s business provides all the reported earnings, and even subsidizes the losses on the remainder of the business. For example, one very successful, industry-leading company earned over 150% of its profits from about 15% of its business, and an amazingly large portion of these profits were simply eroded away by the majority of the business. Importantly, a number of the strategic accounts were providing most of the profits, but a shockingly large number of major accounts were key profit drains. And, it was not at all clear at the onset which accounts were “good accounts,” and which were not. This is very typical. The key to sorting your good accounts from your bad accounts – and your good products from your bad products – is profit mapping. I have explained profit mapping in my Harvard Business School Working Knowledge columns, in my blog posts, and in my award-winning book, Islands of Profit in a Sea of Red Ink. In essence, you can build a profit map by doing an all-in P&L on every invoice line. This yields a very detailed picture of the company’s profit landscape by account, product, vendor, service, cost factor, and numerous other dimensions. Profit Isle has very powerful software to do this, and to create game plans for profit improvement. The reason it is critical to do a full P&L by invoice line is that accounting systems aggregate revenues and costs in separate buckets. This makes it impossible to match each of your revenue sources to the cost of generating it. Think about this: Are all your products priced the same in every account? Is the cost to serve all accounts equivalent? If not, you need to understand how to match specific costs to specific revenue streams on a very granular basis, and this is especially critical for major accounts with substantial bargaining power. These high-profit key customers are your most important asset. In fact, they probably are not even getting as much attention as your large accounts that are unprofitable, because your big, low-profit customers are always pushing and complaining. As a strategic account manager, you have three very important “profit levers” to turbocharge the profitability of your Islands of Profit strategic accounts: (1) profiling and account selection; (2) pricing and product portfolio; and (3) supply chain integration. Think about this: How does your company select new products or new marketing approaches? Odds are that you do a survey and let all customers have a vote. Alternatively, perhaps you give your big accounts more votes than small accounts. But do you give your Islands of Profit customers, which are giving you all your profits and more, enough votes? In building profit improvement game plans for our clients, we very often specifically and carefully survey their Islands of Profit accounts. The results are astonishing. In most situations, the Islands of Profit customers have remarkably similar profiles, needs and views – and these are very different from the overall customer base, and even from the other major accounts. By aligning your company’s products, services, and positioning with your most profitable customer segment, you can directly drive strong profitable growth from the start. Just as important, when you have a clear profile of your Islands of Profit customers, you can identify their critical characteristics and buying triggers. This enables you to increase profitable sales to existing Islands of Profit customers, and to rifle shot your sales and marketing efforts to identify and land new accounts that have the highest potential for strong, fast, high-profit growth. In this way, you can shift resources from low-payoff business to high-payoff business. No more polishing cannons. Once you have identified your Islands of Profit customers, you can look at your own business’s best practice in pricing and constructing a product portfolio for these customers. For example, many sales reps are afraid to price high, especially for a major product in a major account. One top client manager likened this to a fear of getting a “speeding ticket.” Yet, in practice, the sales rep is much more likely to get a “ticket” in a price sensitive, unprofitable major account than in an Island of Profit account. By understanding the difference in best practice pricing in the accounts in the respective categories, reps are much more likely to price their Islands of Profit customers at market. The result: very fast revenue growth that is all profit. Product portfolio – the question of what to sell to an account – has a very similar solution to the pricing dilemma. By identifying the Islands of Profit customers and analyzing best practice set of products bought, you can construct very powerful guidance for the sales reps. Here, again, you are analytically removing the sales to large, unprofitable customers (which we call Coral Reefs) that muddy your understanding of your most profitable (real net profits) strategic accounts. This creates a clear best practice pathway to fast sales growth in key highly-profitable accounts. Moreover, we have found that the real super-sweet spot for high profit growth is selling Islands of Profit products in Islands of Profit accounts. By really digging in and understanding these two critical categories, you will be able to laser-focus your selling efforts on where they will pay off fastest and strongest. For strategic accounts, supply chain integration is a prime sales and profitability weapon. I have explained this in my writings (for example, see Profit from Customer Operating Partnerships). Supply chain integration gives you three critical benefits. First, you reduce your key customer’s cost of operations, often by 40% or more. These savings stem from reduced inventories, duplication of services, and other factors. Second, your own sales grow, often by 35% or more in your highest-penetrated accounts. This very fast, massive sales growth is driven by the huge customer cost savings, and by the operating level relationships that develop between your grass-roots operations staff working in the customer, and the customer’s counterpart operations managers. Third, your own cost of operations drops, often by 30% or more. These savings occur because you now can control and stabilize your key customers’ order patterns, enabling you to reduce inventory, shipment frequency, and expedited movements. Importantly, this major saving enables you to keep your prices stable, and still strongly grow your profits. This leads to a crucial question: Why not do this with all your key accounts? The problem is that supply chain integration takes time and resources to develop. And, if your customer is a transactional buyer with a weak capability to partner, your costs will blow up and your profits will plunge. This leads many companies to be very hesitant to enter into these relationships at all. Which customers should you approach for supply chain integration? The answer is clear: your long-term Islands of Profit customers. 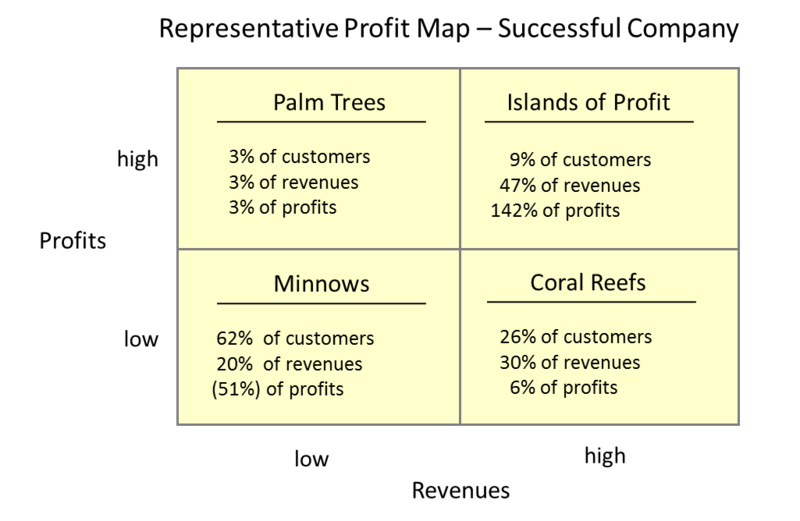 Yet, if you can’t identify your Islands of Profit customers, you should rightly fear simply responding positively to any large customer request for supply chain integration – especially since your Coral Reef customers (large and unprofitable) are most often the ones that are most aggressive in pushing for these advanced services with no intention of adequately paying for them. And if you devote your precious resources to supply chain integration with your Coral Reef customers, you are not only buying a cannon – you are walking into quicksand. Strategic account managers are vital to a company’s success. When you identify and deftly manage your Islands of Profit accounts, you create fast, powerful growth in both revenues and profits – strategic account management’s ultimate prize. This is the essence of turbocharged strategic account management. The critical question for all strategic account managers is: Can you identify, secure, and grow your Islands of Profit Accounts, and laser-target new accounts that belong in this group? If so, you have an opportunity of a lifetime to build really fast, strong profitable growth. I will be presenting a live webcast, “Secure and Grow Your Islands of Profit Customers”, on Thursday, September 19 from 1-2 p.m. EDT, offered by Modern Distribution Management. There is no charge for this webcast. Price war! How can you win without destroying your own profitability? Fire a bigger weapon? Outlast your competitors? Any way you look at it, a price war is the ultimate in self-destructive, lose-lose behavior – but it is one of the most common of all management problems and concerns. Paradoxically, not only is a price war devastating for you and your competitors, but it is very bad for your customers as well. When a customer forces its suppliers to focus on price competition, it loses the opportunity to work with its suppliers to increase its real long-term profits in two crucial ways: (1) by reducing the joint costs of doing business together, and (2) by helping the suppliers to find creative ways to turbocharge their customer value proposition. In short, the real win strategy – for both customers and suppliers – is to turn the price war into a value war. When confronted with aggressive competitor pricing, the instinct is to respond with a price cut. After all, why lose the business? Even worse, if you lose those customers by failing to respond, you could be in danger of losing them permanently, sacrificing the lifetime value of the relationship. This concern pushes managers to respond even more aggressively, and before long the pricing discipline of the competing businesses collapses, and with it goes the company’s profitability. What can a manager do? The best tactical answer is to attack the hidden assumptions that frame the price war. For example, if a competitor quotes an uneconomically low price, why not suggest to the customer that it demand a five-year contract. After all, the price certainly will rise back to former levels once the incumbent is out of the picture. This demand will force the attacker to back down because the losses would be too great over a multi-year period. Another effective tactic is to rein in the instinct to respond where the attack takes place. In most price wars, the attacker aims at your most lucrative accounts and products – your Islands of Profit. By responding where you are attacked, you effectively do the most damage to yourself – and often the least damage to the attacker. In fact, in most price wars, the attacker is funding the price war by maintaining a very lucrative, protected portion of its business – its Islands of Profit – as its core source of cash flow and profitability. The answer? Strike back at the competitor’s source of cash flow. A classic example comes from the airlines a few decades ago. Some carriers, like United and American had very lucrative east-west routes (e.g. NY-LA), while others, like Delta, had very lucrative north-south routes (e.g. NY-Miami). When an east-west carrier tried to enter a north-south route with low prices, the incumbent’s most common response was to match the price reduction, thereby losing a huge amount of money in its lucrative north-south routes – routes in which the attacker had little to lose but much to gain. These tactics are effective in framing an effective response to a price war. But how do you actually prevent one? I was asked this question a few weeks ago by a writer who was working on an article about distributor branch pricing. She asked how much “wiggle room” branches have when it comes to differentiating themselves from the competition based on price, and whether there is an argument for price matching if a customer comes in demanding a cheaper price they may have received down the road. The answer is that there is a progression of three increasingly effective ways to respond to a price war – match the price, lower the customer’s total cost, or increase your value footprint. Price. The seemingly obvious, and instinctive, way to respond is to simply to match the competitor’s low price. This is an invitation to lose your profitability for two reasons: (1) your competitor probably will up the ante with another price cut, setting off a vicious cycle, and (2) you are essentially training your customers to hammer you on price at every turn. After all, you’re showing them that you will fold under pressure. The more effective counter-tactics mentioned earlier – shift the time frame or shift the locus of attack – are much more effective than simple price matching. But it is even more effective to proactively act to prevent a price war. You can do this in two ways: reducing total cost and turbocharging your customer value proposition. Total cost. The second – and much more effective – way to respond is to systematically find ways to reduce the cost of doing business with your most important customers. By reducing costs for both your customers and for your own company, you can create real new value that will endure in the long run. Smart customers will strongly gravitate toward this process. You can take measures to reduce your customer’s direct cost. I outline and discuss these profit levers in my book and in many of my blog posts. They range from operations cost reductions (e.g. flow-through supply chains) to product/category management (e.g. product rationalization). Conversely, customers can create surprisingly big cost reductions for the supplier. For example, by helping the customer smooth its order pattern, you can reduce your supply chain costs, often by 25% or more. Better forecasting offers similar gains, as does a limited but well-aimed product substitution policy. These profit levers benefit both the supplier and the customer – by much more than a simple, temporary price cut. Smart suppliers pass a big portion of their savings back to their customers in price reductions. Here the customers know that the price reduction is fully warranted by real savings, and therefore can endure over time. Customer value. The third, and most effective, way to “win” a price war is to prevent it by waging and winning a customer value war. Yet all too many managers think of this last, if they consider it at all. Think about the example of Baxter’s Stockless business that I have often cited in my book and blog. For example, see: Profit from Customer Operating Partnerships. Several years ago, Baxter was stuck in a price war, with its products like IV solutions, viewed as commodities mostly bought on price by low-level hospital purchasing staff. Baxter mapped the joint hospital-Baxter supply chain, and discovered that it could enormously reduce both businesses’ costs by sending a supervisor into a major hospital to count the needed product, then picking orders into ward-specific totes, and delivering and putting the product away on the patient floor or clinic. This was the forerunner of vendor-managed inventory, which many companies offer today. Incidentally, Cardinal ultimately bought this business from Baxter, and Cardinal’s ValueLink offering is still an extremely effective business run in many of the best major hospitals. Stepping back, Baxter developed a way to permanently “win” the price wars that raged in its business by converting them into a one-firm race to lower the total cost of the joint supply chain, passing this saving to the hospitals. And this saving was so large that it dwarfed the pennies at stake in the price wars. However, Baxter packed even more into this business initiative. In the prior period, before the Stockless/ValueLink was developed, the hospitals were reluctant to operate a large network of off-site clinics and surgical centers. Many top hospital managers did not have confidence that their materials management staff could handle the complex scatter-site network of critical products. The new partnership with Baxter enabled the hospital executives to gain confidence that the newly created supply chain, managed by a supply chain expert like Baxter (now Cardinal), could support the evolving network of facilities. In short, Baxter created a fundamentally new value proposition for the hospitals – enabling them to radically change the way they operated to bring huge new value to their customers – the patients. The progression was incredibly powerful: from price matching, to total cost reduction that competitors couldn’t match, to partnering with the hospitals to create a fundamentally new and much more effective value proposition for the patients, which again the competitors could not match. Baxter did not just win the price war – it eliminated it. Baxter won the customer value war. GE is a very insightful, innovative firm. GE managers are trained not just to compete effectively, but to relentlessly search for fundamentally new and better ways to do things – winning by changing the competitive game. A prime example of this is the decision of the GE aircraft engine group to change its product offering. In the past, the company offered traditional but effective product centered on aircraft engines and spare parts. However, insightful executives stepped back and reflected on what GE’s airline customers really wanted: not just engines and parts, but rather, hours of engines effectively powering their aircraft. After all, they were in the business of flying passengers. In response, GE developed a fundamentally new offering: “power by the hour”. GE wisely combined its prior offerings – engines, parts, and related services – into one offering that directly addressed its customers’ needs. Much as Baxter did for the hospitals. Not only did this new “power by the hour” offering meet the customer needs much better that any competitive offering, but importantly, it combined a package of products and services that no competitor could match. GE redefined its market so it had virtually no effective competitors. Baxter did the same. So did Southwest Airlines. The key imperative is very clear: Once you have a lead, step on the gas – and the most effective way to do this is by turbocharging your customer value proposition. Winning the customer value war is most often surprisingly easy because your competitors rarely think about it. All too often they focus on tactics like price optimization, rather than accelerating their customer value proposition. This is especially critical for securing your Islands of Profit – your high-revenue high-profit business. These customers are most susceptible to a competitor incursion, yet these also are the customers that are most receptive to innovations that fundamentally reduce your joint cost structure and transform your customer value proposition. Your Coral Reefs – your high-revenue low-profit customers – on the other hand, are usually the most price-sensitive. Yet, many can be converted into Islands of Profit if you develop a compelling value proposition. The same goes for your Minnow customers – low-revenue low-profit – especially those that are someone else’s big customers and are just using you to discipline the competitor’s prices. The essential question is: Are you so busy with tactical issues like price wars that you “do not have the time or resources” to systematically and relentlessly build your customer value proposition? Especially for your Islands of Profit Customers? Winning the customer value war is the only way to permanently prevent price wars and really secure your future. I will be presenting a live webcast, “Selling for Profit: Turbocharge Your Profit Growth Through Market Development and Sales Management”, on Thursday, May 10 from noon to 1 p.m. EDT, offered by Modern Distribution Management. There is no charge for this event. A few months ago, I met with the management team of a medium-sized company having sales problems. The company was in a commodity business, and the sales reps were stuck trying to sell to low-level, price-oriented purchasing personnel in the customers. What could they do? The answer that I heard: hire rainmakers with C-level contacts. This seemed like a replay of many meetings that I’ve attended over the years. The real issue is that this common reaction is aimed at a symptom, not the underlying problem. The real problem is not the level of customer contact – it is that the company’s value proposition is not sufficiently innovative and compelling. The reality is that a rainmaker sales rep with a me-too value proposition will wear out his or her C-level welcome very quickly, while a rep with a compelling value proposition will quickly attract C-level attention. The key to turbocharging your company’s value proposition is to build your extended product. Your extended product is the full range of attributes that a customer experiences when obtaining and using your product. If you are selling office supplies, for example, the extended product includes product information, convenient shopping or delivery, payment terms, instructions, easy return process, strong warrantee terms, and a host of other attributes. In fact the nature of an extended product is so broad, that there is always room for great creativity and improvement. Think about the smart phone you have in your pocket. The core telecommunications product, phone service, has long been available through your home phone, your office phone, and a dense web of pay phones. But once you have experienced the convenience of having a phone with you all the time, the extended nature of the portability changes your perception of telephone service. Throw in email and other applications, and a new product is born out of an old commodity service. I remember advising several major telecom companies soon after deregulation, when wireless service was in its youth. I can conjure up a mental picture of a young product manager going before the investment committee of a major telephone company with the proposal to build an extensive new wireless network so adults wouldn’t have to stop at a gas station to make a call, and teenagers could call each other across the middle school courtyard. The manager would have been laughed out of the room. And then the investment committee would return to its “serious work” of figuring out how to lower costs because traditional telephone service was a commodity under continuous price pressure. It took a visionary entrepreneur like Steve Jobs to see the possibility and value of an extended telecommunications product. The result: enormous success and hundreds of billions of dollars in company value. I have written several times about my experience working with Baxter to develop one of the first, widely-followed vendor-managed inventory systems. This system, now named ValueLink, is at the heart of much of Cardinal Health’s medical supply business. It represents an innovative extended product that led to enormous value and transformed an industry. Initially, Baxter was a provider of commodity products like IV solutions. It sold to low-level price-oriented buyers in hospitals, and was subject to constant price wars. Once Baxter dropped its supplies on the hospital receiving dock, its business was completed. A small work team was commissioned to explore how to break out of this impossible situation. The team decided to simply go exploring and discover what happened after the supplies were received by the hospital. Within a few days, they were stunned by what they found: if the value of a liter of IV solution was a dollar at the receiving dock, the total cost by the time it was administered to a patient was a multiple of that number. And with duplication of activities between Baxter and the hospital, the company had an opportunity to take a multiple of the product cost out of the hospital’s system. All of a sudden the world changed for Baxter. The company developed the now-familiar system in which it placed in the hospital Baxter operations personnel who counted the hospital’s inventory and transmitted the information to Baxter’s distribution center, where automated systems picked the product into totes destined for patient care areas. These totes were put away by the Baxter personnel on site in the hospital. The upshot was that the hospital’s costs plummeted and service improved to near-perfect levels. Once the hospital CEOs saw this new system, and experienced the magnitude of the savings, they swung into action. They simply asked Baxter two questions: (1) Can you really do this? and (2) Can we trust you? The answer to both questions was positive, and the result was over 35% sales increases in the highest penetrated accounts in the country. In comparable situations, I have almost always seen gains of this magnitude. This is the power of creating an innovative extended product – a compelling new value proposition. No rainmaker with CEO contacts needed here. In fact, when I start working with a new client, one of the first things I do is read the customer service surveys. Buried in most surveys is an innocent-looking question that goes something like this: Which supplier do you trust to help you manage change in your company? If the client is the supplier trusted for change management, the rest is relatively straightforward. If not, we know how to climb that mountain. About a year ago, I participated on a panel on supply chain transformation along with top officers from P&G, Pepsi, and Chiquita. All three companies were making lots of money and gaining significant market share, even in the depth of the recession, by doing essentially the same thing. They had identified the customers in their sweet spot – their islands of profit and those that should be in this category – and they were focusing and investing their resources to develop innovative ways to make these customers more profitable on handling and selling the supplier’s products. When the customers made more money on the supplier’s products, they increased the supplier’s market share, and greatly reduced the price pressure. At the same time, the coordination led to important operational efficiencies for the supplier: better forecasting, smoother order pattern, etc. So the supplier became much more profitable, even as the customer increased its profits and rewarded the supplier with a massive gain in share of wallet. These smart suppliers reinvested a big portion of their new profits in renewing the cycle by finding ever-new ways to expand their value proposition. This was a real win-win both for the supplier and for the customer. The only losers were the suppliers’ competitors, who were frozen like deer in the headlights trying to cut costs across the board. Innovative companies in every industry have an opportunity to turbocharge their value proposition by creatively pushing the envelope on developing their extended products. Take financial services. It would seem that lending money is the ultimate commodity business. After all, money is fungible – which means essentially that you can’t tell one dollar from another. Yet even financial services companies have terrific opportunities to build their value proposition. For example, one company segmented its customers, and developed highly streamlined processes and customized information for its sweet spot customers. At the same time, it drew on its vast local experience and contacts to help these target customers grow and succeed, and it committed to support them in good times and bad. This was a very compelling value proposition, which converted its commodity business into a highly differentiated one. What does it take to develop your value proposition? An open mind, clear vision, and a little legwork. The Baxter innovation began as a “showcase” project. Baxter simply contacted a friendly hospital and asked if it could send in a small team to look around. The objective was to try to find new ways to improve customer service and lower costs. The team – and the hospital – didn’t know what it would find, but both thought it was a good idea to take a look. Once in a customer, it is very important to look with an open mind at what the customer actually does and experiences through the entire cycle from discovering a need to consuming the product (and even needs that arise after consumption). The objective is to “walk in the customer’s moccasins,” and the best technique is simply to spend a lot of time observing individuals as they go about the process. Questions can come later. When he visited the company, he was amazed by the creativity and innovativeness of the process. He took the knowledge back to Canada, reorganized the company’s manufacturing process, and produced stunning results. The process was soon implemented in GE’s appliance manufacturing facilities around the world, and now – like vendor-managed inventory and make-to-order manufacturing – is a standard way for leading companies to do business. Every company has an opportunity to turbocharge its value proposition. The rewards are tremendous: strong competitive differentiation, surging profits, and expanding market share – even in a commodity business. No, especially in a commodity business. What’s preventing top managers from pushing the envelope on value creation? In most cases, it is the strong human tendency to simply assume the status quo and focus on tuning it up. Turbocharging your company’s value proposition costs nothing and takes little time. All you need is an open mind, clear vision, and a commitment to do things better. Today’s market leaders all are constantly, almost frantically, trying to push the envelope on their value proposition. That is how they became market leaders, and that is why they stay that way. Why not decide to do the same? After all, that’s all it really takes.